Three instruments are very helpful in the diagnosis and management of AMD. 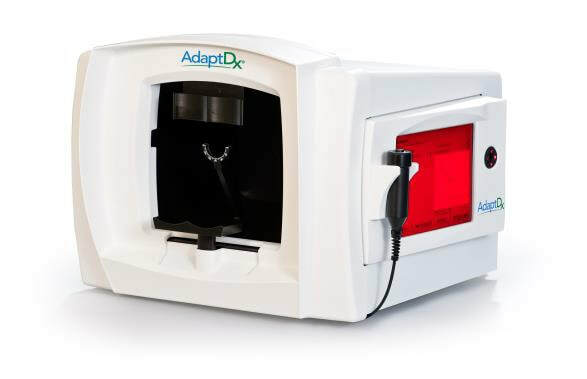 The AdaptDx Dark Adaptometer helps diagnose AMD at the Sub-clinical Stage and monitor disease progression. If you are experiencing problems seeing or driving at night or it is becoming increasing difficult to read in dim light, talk to us about scheduling an AdaptDx test. It measures the time it takes for your vision to adjust to the dark. This is called dark adaptation. The simple test takes less than 10 minutes. You’ll look into the device in a darkened room and press a button every time you see a flashing light. The Topcon TRC-NW400 retinal camera helps to diagnose and document the macula in Early to Intermediate Stages of AMD. 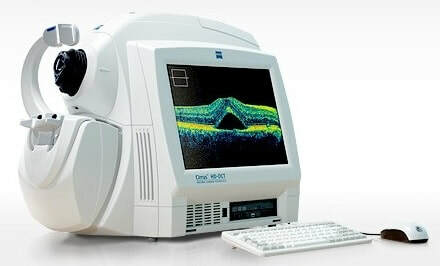 It a fully automated, easy-to-use, auto-focus, auto-capture non-mydriatic retinal camera that is designed to obtain high resolution color images of the retina. It is equipped with automatic focusing and capture and a fully automated mechanism that moves the optical head from one eye to the other without operator intervention. The Zeiss Cirrus HD-OCT helps to diagnose and document the macula in Intermediate to Advance Stages of AMD. It offers superior visualization of the anatomical details of the macula. The 3D layer maps, retinal images and quantitative analysis reveal clinically relevant details that improve detection and monitoring of retinal conditions.